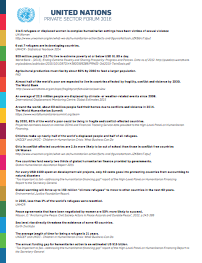 2016 is a year of action: the United Nations, Governments, Business and Civil Society are coming together to jump-start progress on the Sustainable Development Goals (SDGs). This year the UN Private Sector Forum focused on the role of business in advancing sustainable development to prevent global instability. Hosted by UN Secretary-General Ban Ki-moon, the Forum was organized in collaboration with the Co-Chairs of the United Nations High-Level Meeting of the General Assembly to address Large Movements of Refugees and Migrants. With the theme of Business and the 2030 Agenda: Securing the Way Forward, the Private Sector Forum highlighted important connections between the Sustainable Development Goals (SDGs) and the new Agenda for Humanity – which, together with the Paris Agreement on Climate Change and the Action Agenda on Financing for Development, are pillars of the 2030 Agenda. Over 60 million people are displaced by conflict and instability worldwide, and average displacement time now stretches 17 years. These staggering numbers challenge global efforts to secure a truly sustainable and prosperous future for all. Advancing the 2030 Agenda is crucial to stem growing flows of people fleeing conflict and insecurity around the world, address root causes of instability, and avoid future crises caused by large scale migration and forced displacement. Whether creating jobs, investing in education, skills, and training, supporting refugee resettlement efforts, or tackling underlying causes of displacement like climate change, companies can have a huge impact in preventing instability and helping peaceful societies flourish by investing in the SDGs. The Private Sector Forum identified and showcased business contributions in these areas and explored opportunities for greater collaboration between the UN and the private sector to secure a peaceful and sustainable future for all. A number of commitments to action were made by companies in attendance. Learn more. 2014 Private Sector Forum commitments to climate action, where are they today? Find out here. (As of 14 September). Download Programme as a pdf. Organized in the context of the UN High-Level Meeting of the General Assembly to address Large Movements of Refugees and Migrants, the Private Sector Forum features an interactive roundtable segment where participants will be encouraged to share their ideas and engage with other participants. 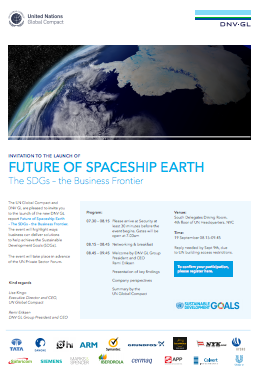 Launch of a new resource developed by DNV GL that highlights ways that business can deliver solutions to help achieve the Sustainable Development Goals (SDGs). Leading the way in the SDG era: CONNECTING GLOBAL BUSINESS. 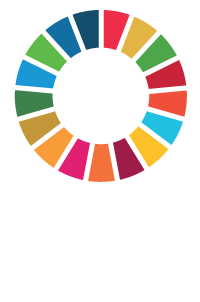 The UN Global Compact together with Monday Morning/Sustainia will present The Global Solutions Platform – the place where business solutions for the global goals will be connected and communicated – and where the SDGs are turned into a new era for responsible business. The event will feature a preview of next-generation initiatives in collaboration with GRI, PRI and Volans. 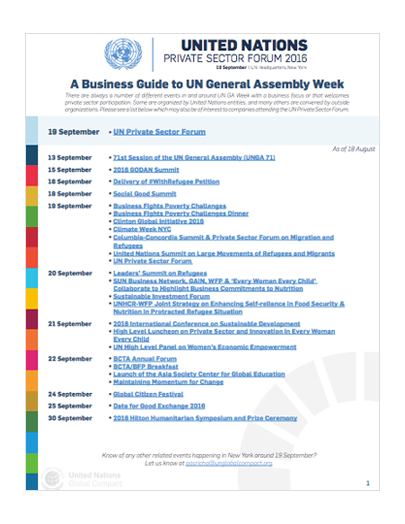 There are a number of different events in and around UN General Assembly week with a business focus, and many other events which welcome private sector participation. Some are organized by United Nations entities, and many others are convened by outside organizations.